It is not easy to believe that men could wear a heart shape ring, the increasing demand for Kaisilver mens claddagh rings has some very logical reasons though. As far as basic features are concerned, there is not much difference between a men's claddagh ring and that worn by a lady. However some dimension and structural changes do exist between both these rings. Kaisilver is today regarded as the world's best source for the historic claddagh ring - we provide both gold and 925 sterling silver claddagh rings for men. You might find it interesting to know that we have many Irish buyers who proudly wear our claddagh rings. This is truly interesting because Ireland is where the first claddagh ring was made more than 3 centuries ago. Mens claddagh ring, a rugged and impressive claddagh ring for men with gemstone of your choice. Both gold and 925 sterling silver claddagh rings are available for men. 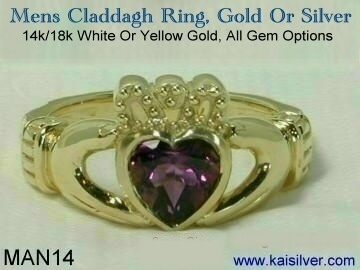 All Kaisilver claddagh rings are custom made in all sizes ... more. The MAN14 gold or silver claddagh ring for men is one of the most popular mens claddagh rings. The ring has a fine design which is not dainty or feminine, a handsome metal weight of around 20 to 28 grams is provided for the jewel. If you choose to get this claddagh ring for men in gold, you can choose a 14k or 18k claddagh gold ring for men. The ring is shown as an amethyst gem stone men's ring but, you could choose the gem stone of your choice. While most men prefer to have their claddagh gold or 925 silver ring without diamonds in the crown, this is an option that you can consider. You must have read the statement from Kaisilver experts that, the claddagh ring is history's most meaningful jewels. To understand this statement, you need to know the history of this historic jewel. The story of the claddagh ring remains for same for lady's or men's claddagh rings, let us briefly narrate the interesting story to you. Almost four centuries ago, the claddagh village in Ireland was a scenic location most inhabitants of the claddagh village relied on fishing for their livelihood. A young fisherman by the name of Robert Joyce and his beloved lived in this beautiful village. One day young Robert joined his friends on a fishing trip, unfortunately the boat was captured by pirates on the high seas. That was the time when slavery was rampant in Ireland, all the inmates of the captured boat were sold as slaves. Robert Joyce was sold to a wealthy goldsmith and forced to learn the trade. He worked hard and long hours, but could not forget his beloved who lived in the Claddagh village. The harsh and depressing conditions of slavery could not make him forget here. It was then that he decided to make something for her, he decided to make a ring. He kept dreaming that he would be free one day and gift the ring to his beloved. It was this thought that gave him the strength and courage to carry on. A few years later his dream came true and Robert Joyce and his friends were released from slavery. He headed straight for his village and was overjoyed to see that his beloved was still waiting for him. He gave her the ring, the couple were soon married and lived happily ever after. This ring came to be known as the claddagh ring and was named after the claddagh village. 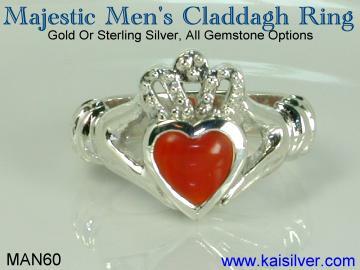 Another handsome mens claddagh ring, all Kaisilver claddagh rings for men can be ordered with an 8mm or 10mm gemstone. The above ring is a mens onyx gem stone claddagh ring but you could choose the gem stone of your choice. Remember that gold or sterling silver claddagh rings are possible for all design concepts ... more. The MAN33 mens claddagh gem stone ring from Kaisilver is shown with a large 10mm gem stone. You can request for an 8mm or 10mm gemstone when ordering the gold or 925 silver claddagh ring for men. Black onyx gems are very popular among men, probably because they have that sturdy and confident look without appearing loud and bright. One of the main reasons for majority claddagh ring buyers preferring the claddagh ring, is related to our thorough understanding of this jewel. A team of Kaisilver experts researched the meaning, history and tradition of the ring for several months. We could have made our job easier by merely copying the design and moving into the production phase, but that is not what we wanted to do. When making meaningful jewels, the designers, craftsmen and gem experts need to feel for the jewel - it requires passion, concentration and patience to craft such an important ring. The research study conducted by our experts have essential inputs that were incorporated into the design, the entire production team actuall realizes the importance the buyer would be giving to this gorgeous jewel. The concentration, dedication and attention of each member of the team ensures that the buyer is always satisfied with the end result. We just spoke about the meaning of the claddagh ring, the story is a classic example of friendship and loyalty. Let us now discuss the features of the claddagh ring. Many people describe the claddagh ring as the 'hands clasping the heart ring', the ring is also one of the few rings that are referred to as the 'faith' rings. The claddagh ring has 3 essential features, the heart being held by the hands and the crown on the heart. Keep in mind that, this jewel was first designed and crafted by a slave who hoped to be united with his beloved. With this as a reference, it is easy to understand the meaning assigned to each of these features. The heart shaped center signified love, the hands symbolized togetherness and the crown denotes equality. The hands symbolize friendship and togetherness, and the ring is therefore sometimes referred to as the friendship ring. When we talk about love, friendship and loyalty they need not always refer to matrimonial relationships - a child could show the same feelings for his or her mother. Similarly a mother might feel the same about her daughter. This is another awesome claddagh ring for men, shown here as a silver carnelian gem stone ring, options for gold or silver are provided. We provide the same craftsmanship and gem quality for both gold and 925 sterling silver mens claddagh gem stone rings ... more. The MAN60 Kaisilver gold or sterling silver claddagh ring is another concept that you can choose. When choosing the gem stone for a claddagh ring for men, the criteria is something that is based on personal preference. For example, a belief or tradition related to a specific gemstone could prompt a buyer to request for that option. For example, a gold or silver carnelian mens claddagh ring could be worn for some special power attributed to the gem. There is a belief that a carnelian gemstone helps a person stay calm and composed. The choice of a mens ruby claddagh ring in gold or silver could be related to, the belief that a ruby brings happiness and stability to married life. 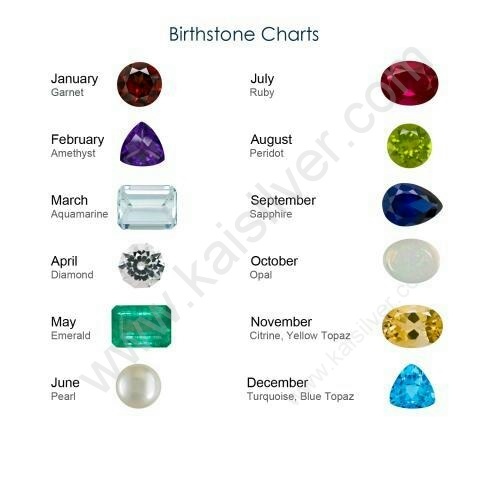 Birthstone rings are also worn to harness the powers of the gemstone. So a garnet mens claddagh ring could be worn as a January birth stone ring. Similarly, an aquamarine claddagh gem stone ring for men would symbolize the March birthstone. A classic gold or silver claddagh ring for men, the jewel retains all the meaning of the centuries old jewel but, takes off the bother of having to maintain and pay for the gemstone in the jewel. Easy to maintain and comfortable to wear, the perfect ring for you if you wish to wear the legend without the fuss ... more. The MAN110 claddagh ring for men has all the essential elements that, are required to give the ring its full meaning and significance. Since the first claddagh ring was made around 4 centuries ago, it is right to say that the jewel did not have any gemstone set in it. Lapidary, the art and practice of cutting, shaping and polishing gemstones developed centuries later. While the addition of the gemstone in a men's gold or 925 silver claddagh ring does enhance the appearance of the jewel and could probably, add some significance to the ring too - it is not considered to be as important as the heart, crown and hands. As most of you would be aware, men are not too careful with the accessories that they wear. Every gem has its characeteristics and these, need to be considered when wearing, cleaning or even storing the jewel. If a man appreciates the true meaning of the claddagh ring but is really not confident about, fussing over the gem in the ring, a plain claddagh ring with no gem is the best way to go. The researched design and healthy metal weight assigned to every Kaisilver men's claddagh ring, ensures that the ring will not deform or dent easily. Since we provide the same quality for gold and silver rings, you can make your choice based on your personal liking and budget. Blue topaz offers three shades of blue and it is the darkest blue or London Blue Topaz, that is highly preferred for men's jewelry. Kaisilver has experienced a consistent demand for the MAN120 blue topaz claddagh ring for men, the fine craftsmanship, impressive blue gemstone and healthy metal weight have drawn quality conscious jewelry lovers to this jewel ... more. 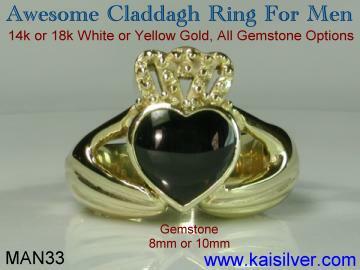 You could order a gold or 925 silver claddagh ring for men from Kaisilver. Jewelry buyers often wonder whether a gem with a specific color would look good when set in a metal. Technically your metal color options would be white (silver and white gold), yellow and pink (rose gold). Blue, black and red gems offer the maximum scope in terms of matching with metal colors - so blue topaz, blue sapphire, blue turqoise and blue lapis would look amazing in silver and all three gold colors too. In general it is observed that men prefer gems with darker colors, though exceptions do exist. If you order your claddagh men's ring with a birthstone - the color of the stone will be decided by the birthstones assigned to each month. Traditional beliefs and customs attached to gems can also influence their selection. The Kaisilver support team is well educated in gemology and also has knowledge about the metaphysical beliefs attached to gems. They can guide you in your gem selection so, do communicate with them before you make a buying decision. 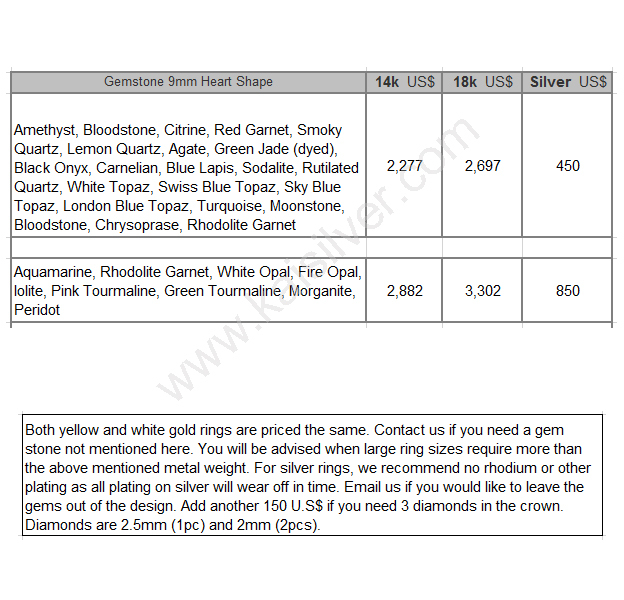 Gemstone pricing is ofcourse one of the criteria that buyers would consider when, choose the gemstone for a mens claddagh ring. 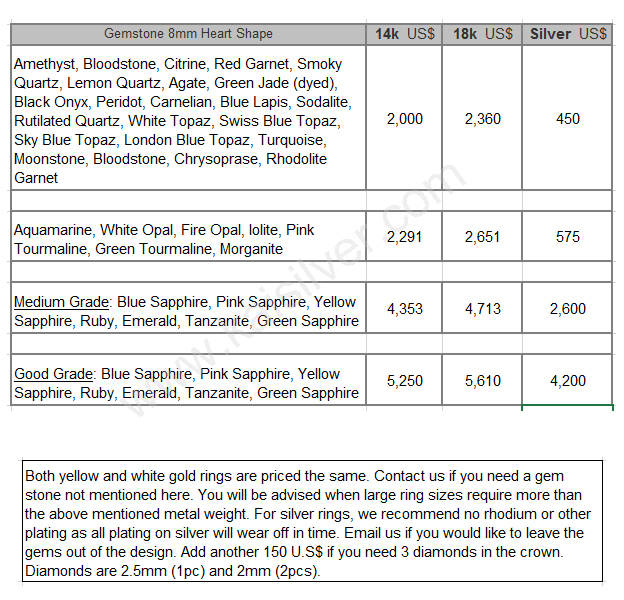 All gems are not priced the same and most gems, get to be more expensive (per carat) when the gem size increases. For example 10mm blue topaz heart gem would be moderately priced but, an 8mm blue sapphire or ruby gem stone would cost many times more than the 10mm swiss blue or london blue topaz gemstone. Technically there is no restriction on gem stone for a mens 925 sterling silver claddagh ring, the choice depends on you on your budget. One very important and common feature that would define the gemstone choice is gem color. For example, blue and black are popular choices for claddagh rings for men. What you need to understand is that, there would be more than one gem option for a particular gemstone color. Your jeweler should explain this to you but, here are some suggestions. 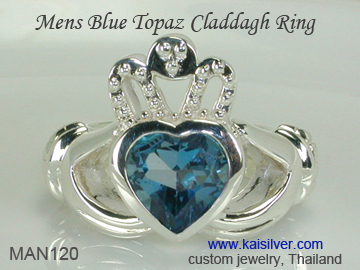 Most people think that blue sapphire is the only good choice for blue gem stone claddagh mens rings, but that is not so. A deep blue (london blue) topaz is also a color that many men life, unfortunately there do exist many buyers who have never head of the gem topaz or the gem london blue topaz. The advantage of knowing color options is that, you can at times get a much more moderately priced gem or, even a more durable stone. A good example of this is a green gem, comparing emerald and green tourmaline - it is interesting that green tourmaline would be much cheaper than an emerald but, green tourmaline is also more sturdy and durable as compared to an emerald. While other jewelers do not care much for what the buyer can save and benefit from at Kaisilver, we urge you to discuss your requirements with our support team at sales@kaisilver.com If your gem selection is based on budget, gem color or some other criteria request for suggestions and options from our team. We are eager to help you even if you finally choose to buy your mens 925 silver or gold claddagh ring from another jeweler. Though pearl is the birth stone for the month of June, moonstone is also designated as the birthstone for June. This is useful when the gem needs to be cut and shaped like a gem. Pearl cannot be cut and faceted like moonstone. Let us now talk about some variations for a men's claddagh ring. We sometimes do get requests for gold or 925 silver mens claddagh rings where. the ring does not have a crown. 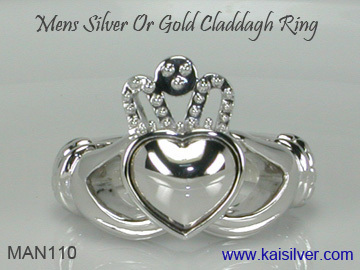 Since every Kaisilver claddagh ring is fully tailormade to buyer specifications, we can exclude the crown from your ring. However if you really want your ring to have the meaning of the original claddagh ring, we would suggest that you keep the crown since it is one of the essential features of the claddagh ring. The choice of diamonds in the crown, does appeal to some men. For an additional charge, we can set 3 diamonds in the crown. The diamonds are 2.5mm (1 piece) and 2mm (2 pieces). Let us know if you prefer to have other gems besides diamonds in the crown of your mens claddagh ring. You could also request for the gem stone in your silver or gold claddagh ring for men to be excluded. If you request for a mens claddagh ring with no gem stone in the center (heart), the entire heart portion would be filled with gold or silver, depending on your metal option. You can also request for a small message to be etched inside the band of the ring. For example, if you get a pair of claddagh rings (men's and lady's) you can exchange names and have the etchedf inside the band. We can do this at no additional charge to you. If you need more information on the above rings, please email our support team at sales@kaisilver.com Do provide details related to metal option, gem option and any other customization requirements that are relevant to the query. The team will be glad to assist you even if you do not intend to make any purchase from us. To order these rings please go to the detailed page here. We will let you know if your ring size is very large requiring additional gold weight. Kaisilver is the world's leading online custom made jewelry provider. We are proud to have more than 10,000 gem and jewelry buyers spread across the globe as our clients. We have always assured buyers of quality merchandise for both gold and 925 silver jewelry. We can craft all types of jewelry with your choice of designs and gem stones. Our resourceful team includes 7 of the finest designers and the best group of jewelry craftsmen and artisans. Gems are procured directly from leading gem cutters or at the mining sites. Our gem experts closely inspect each gem before it is cut by the best of gem cutting talent. We rely completely on satisfied buyers to stay in business and grow. A glance at some of our Buyer Testimonials will give you an idea of the quality of merchandise and service that we provide. Our support team at sales@kaisilver.com is comprised of gem and jewelry experts rather than smart talking sales staff. We evaluate support staff based on the quality of solutions and advice that they provide to buyers and prospective buyers - there is no pressure to push a buyer to place an order. We will have absolutely no problems if a buyer gets all the required information and advice from us and finally, gives the sales order to another jeweler.